Home » Espresso and Coffee How To Articles » Blogs » Coffee and Dessert Recipes » The Monin Inspiration App is Available Now! Find recipes, ideas and inspiration for thousands of uses for Monin syrups, sauces and products! We are entering into a new age of culinary creativity and imagination, and this experimentation naturally includes Monin products. Classically used for coffee drinks and alcoholic beverages, Monin syrups, sauces, purees and smoothies can be used in thousands of interesting and delicious ways, and not limited to beverages! 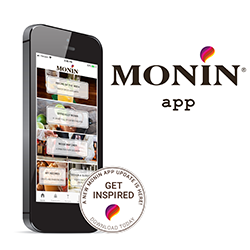 To help with brainstorming new ideas, Monin has created an app called Monin Inspiration that offers thousands of tasty and innovative new ways to incorporate flavours into our cooking and drink making. Comments on The Monin Inspiration App is Available Now!